How would you like a ring of snow to grace your front door? 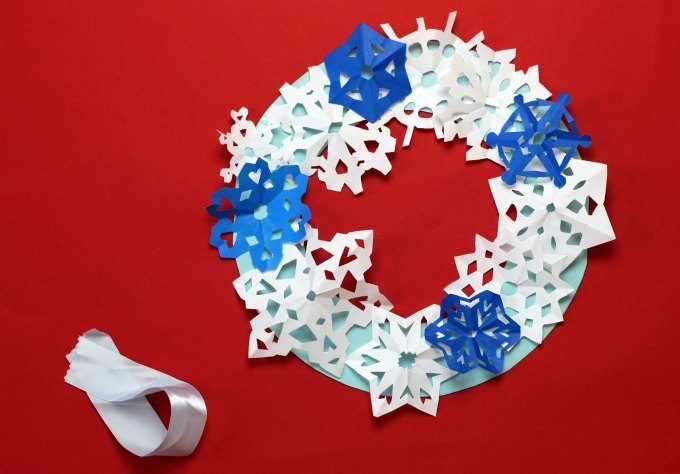 Making a paper snowflake wreath is a fun, simple winter craft for kids. 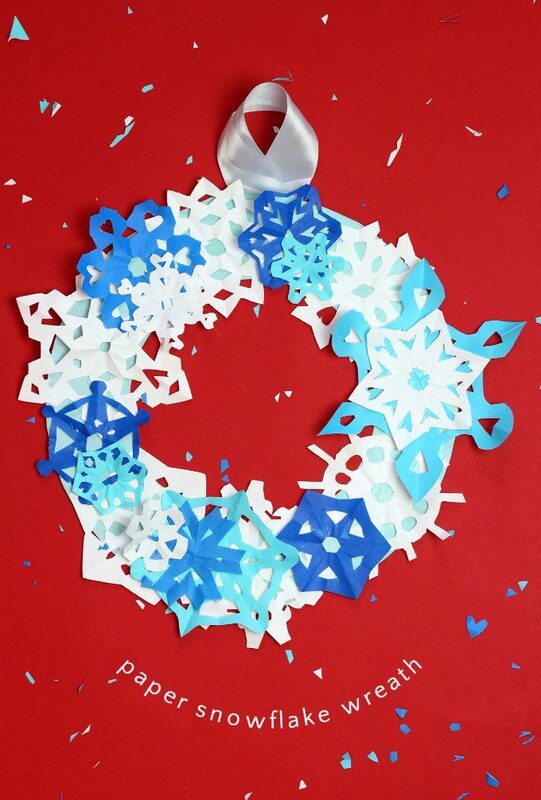 It’s a great way to use up all those paper snowflake if (like us) you are addicted to making them! If you use non-Christmas colors, this can be a winter wreath and will be festive all season long. Large piece of card stock, poster board or other heavy paper. You can also use a paper plate. Paper for making snowflakes. My favorite paper for cutting paper snowflakes is origami paper. It is just the right weight! Thin enough to fold and cut easily, but not so flimsy as to flop over. Glue or tape. I used rubber cement, but you can use white glue or double-sided tape. Cut your card stock into the desired size for your wreath. I didn’t have a single piece of paper that was large enough so I taped two pieces of blue paper together. I traced a dinner plate and cut out the resulting circle; I traced a smaller dinner plate inside and cut out the center. 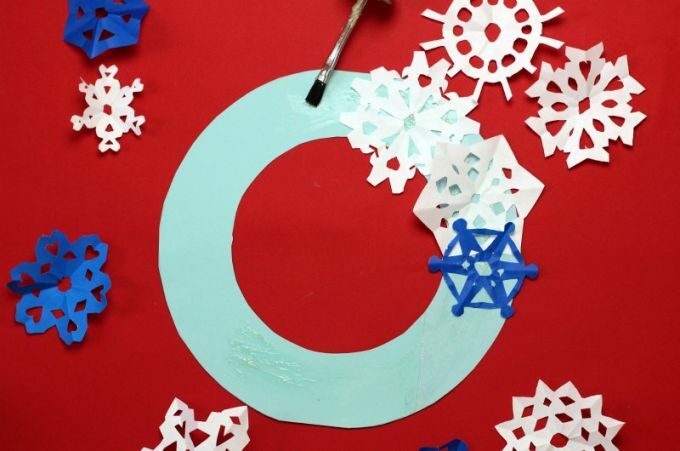 Make your paper snowflakes. If you need instructions, watch my how to cut paper snowflakes video. You can mix it up by making snowflakes out of foil paper, tissue paper, cellophane and origami paper. You and your child may also want to make snowflakes in varying sizes and colors. Decide on the outlay of your snowflakes. I advise doing this before you begin with the gluing, especially if you are using white glue. That way your child can make sure the smaller snowflakes are on the top! Spread glue all over the paper wreath. I used contact cement, because I like the control and ability to reposition the snowflakes but it’s not for small children. My son made one with regular white glue and it worked just fine. Alternatively, you could use double stick tape, but it will be much more difficult to reposition the snowflakes. If desired, attach a looped ribbon to the back of the wreath and hang up. Alternatively, you can hang your wreath on the wall with painters’ tape! If you find that you and your children became addicted to the immense pleasure of cutting out paper snowflakes and now you have a paper blizzard, try one of these ideas for what to do with paper snowflakes. In my humble opinion, all crafts should be this easy! 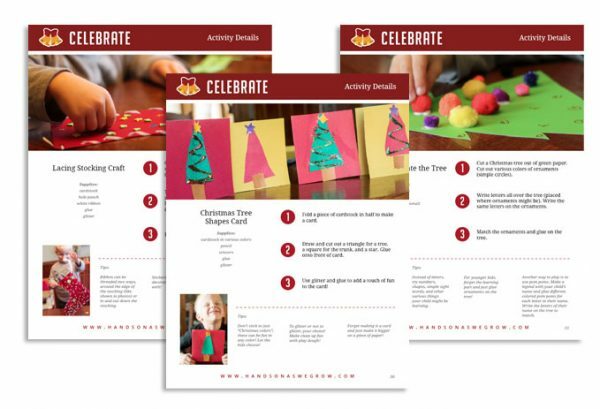 If you are like me and end up getting overwhelmed by the holiday activity planning process, take a peek at Joyful Christmas Activity Ideas. I absolutely love these ideas and especially how everything is organized and you already have all the resources in your home.